LoLK Lunatic overall record is now with Reisen?! 3,090,923,400 by huf. It seems they've been gradually improving Reisen over the last few months. Also, just like with Lunatic, HSiFS Normal has already passed the corresponding IN Normal record, 4,601,923,520 by sonitsuku. GFW Lunatic A2 was raised to 128,380,620 by MegaPulse. Same deal as before, though I also came across an earlier personal best of 127,547,600 of his that he recently uploaded to (I assume) his YouTube. HUF also raised LoLK Lunatic to 3,209,081,800, あおち (aochi) got 7,477,932,830 in HSiFS Lunatic and izumico raised HSiFS Extra to 3,252,215,310. No replay for the latter, but I've seen it being gotten live on stream on CaveTube. HSiFS Reimu Extra replay is available on royalflare history. There's a couple new world records in HSiFS. 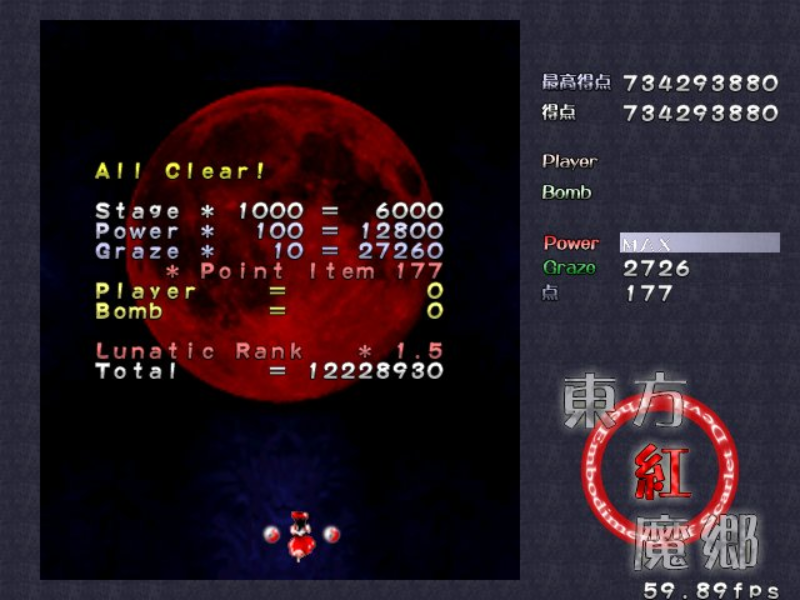 First, yuushaou broke the 5 billion barrier on Normal with a score of 5,022,740,050 back in November. And just today, Cirno set a new record of 1,551,361,400 on Easy using the Winter season, and almost reached the piv cap. Was quite surprised to see Summer being overtaken by Winter on Easy. 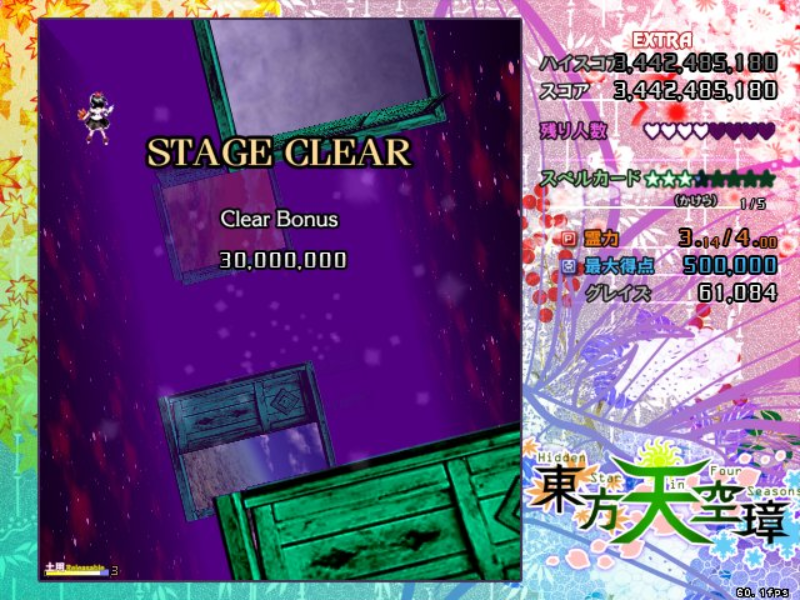 Finishing the year, aochi got 7,540,456,210 in HSiFS Lunatic, with Marisa/Fall. HSiFS Easy was raised to 1,621,412,360 by Cirno. As for scores from a while back, ニャムニャム raised UFO Extra to 740,972,090, MegaPulse raised GFW Lunatic to 128,637,250, Marisa raised DDC Extra to 1,233,372,960 and Kisara raised LoLK Normal to 2,625,622,800. Technically kisara also raised LoLK Hard to 2,596,367,480, but it's a Game Over on penultimate spell. Is 桜庭ローラ the same person as aochi? The in-game replay name is aikatsu. 桜庭ローラ is the same person as aochi. Even though he used different names for both replays, both of his clears were on his Twitter. Vex got 11,695,280 in HRtP Hard (Makai). Kisara got 2,711,256,800 in LoLK Hard with Sanae and also got 1,710,604,140 with Reisen on Easy. 桜庭ローラ got 8,158,881,390 in HSiFS Lunatic with Aya/Autumn. Also to clarify, supposedly this player's name is referred to as "hayamin". レックス (REX) got 1,826,352,390 in HSiFS Easy with Cirno/Winter. Then something I noticed on the list some time earlier, is the MS Lunatic record is 173,066,760 by Arashi Ai. Though those I asked, didn't know a thing about this person and his score, nor know of any existing proof. How exactly did you guys come to know about this score in the first place? I don't actually recall where that came from, but it's not in the last version of Shimatora's post, so it was added after the spreadsheet formed. I guess Zigzagwolf mentioned it at some point that I forgot? I'd PM him but it seems he hasn't been active lately. I just heard that this "Arashi Ai" is a Spanish scoreplayer who posted a screenshot of his run on this Spanish forum site. But apparently the screenshot that was posted no longer exists. Not even retrievable with the Wayback Machine. So that said, it's up to you people whether the score is worth keeping on the scoreboard or not. One thing I heard I wasn't aware of, is that apparently Spanish players in the past were very notorious for cheating. Either way this score is nothing super-spectacular so in this case it's debatable at best. Also some small errors in the document, HRtP Normal record was in the Jigoku Route. Yu~Suke's PCB Easy record has no replay according to the document, but there is one on the Wiki. Izumico has a higher score in EoSD Hard from a while back that's not listed. That being 551,876,370 with ReimuB. Should be updated. Impressive improvement to HRtP Easy. Where's the PCB Easy record replay you mention? There isn't one on the wiki now, and your link leads to a Chinese(?) .jpg file. EDIT: The link should be fixed now and lead to the replay. For some reason they replaced the extension with .jpg even though the .rpy file is still uploaded on the Touhou Wiki. 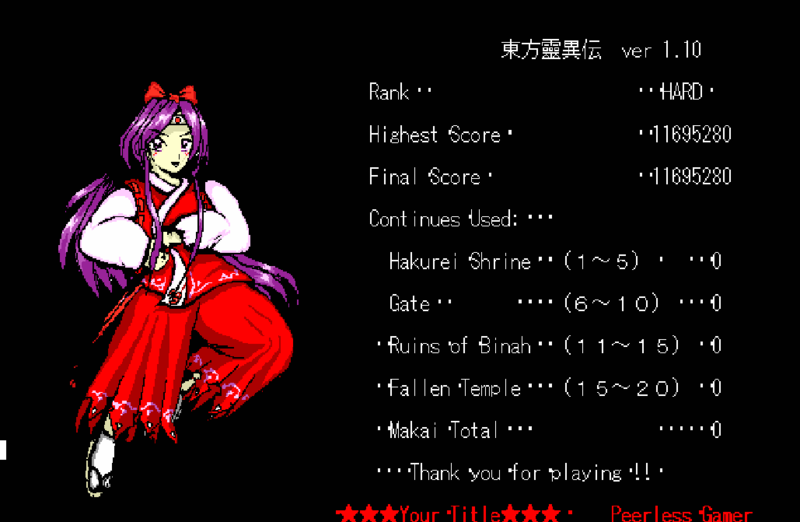 Oh, and I also found ARF's old MoTK record of HSiFS Extra on the Touhou Wiki. It still links to a dead link because it was uploaded on RF's temporairy uploader. As for my HSiFS Normal MoTK record, that one has found it's way on to the Wiki as well. HSiFS 8,377,262,100 by そにつく (sonitsuku). Edit: I also found a method to display "100%" instead of "100.00%" in the spreadsheet, when the WR is here on MotK. Any opinions on which looks better? "100%" with no decimals is accurate to Shimatora's old layout, but I'm not sure how it looks on a spreadsheet. Additionally, izumico's video of his EoSD Extra record was deleted and his Twitter account was deleted as well. I personally have no preference for how percentages are shown. I think it's fine the way it is.